Half of the attacks were in the Mariupol sector. The situation in the antiterrorist operation (ATO) area in Donbas remains tense. Since midnight, pro-Russian militants have violated a cease-fire 20 times, the ATO press centre has said on Facebook. In the Donetsk sector, the militants launched their fire attacks mostly before the dawn. They fired on Luhansk with 122-mm heavy artillery, on Avdiyivka and Verkhnyotoretske with 82-mm mortars, grenade launchers and large-calibre machine guns, and on Zaytseve with handheld anti-tank and automatic mounted grenade launchers. 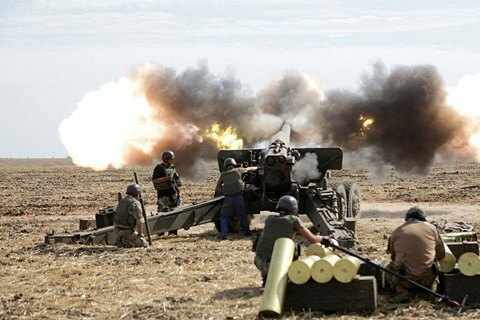 Ten fire attacks were registered in the Mariupol sector. The ATO troops in Krasnohorivka faced three attacks by militants who used 120-mm and 82-mm mortars. In Novotroyitske and Shyrokyne, the separatists used grenade launchers, and in Hnutove and Maryinka heavy machine guns. Enemy armoured vehicles were spotted in Shyrokyne. In the Luhansk sector, it was hot in Novooleksandrivka where the enemy fired with 120-mm and 82-mm mortars. Firearms were used against Popasna. The militants fired on two freight train locomotives at the Skotovata railway station in Donetsk Region. No-one was hurt. One Ukrainian serviceman was killed and five were wounded in the Mariupol sector in the past 24 hours, a spokesperson of the presidential administration for ATO issues, Oleksandr Motuzyanyk, said in a regular morning update. Ukrainian Defence Ministry: FSB allegations "red herring"
Ukraine dismisses Russian FSB statement on Crimea as "provocation"